The Satin Daisy Collection is made with a very fine white or ivory satin fabric and incorporates a daisy theme with daisy appliques. 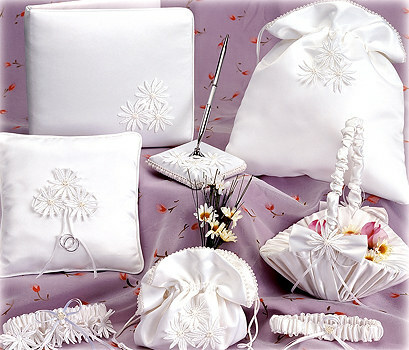 The Satin Daisy Collection features a guest book, guest pen, ring pillow, flower girl basket, money bag, bride pouch, ring pillow and a bridal garter. Perfect for a floral themed wedding.